The Canada Winter Games represent a unique opportunity for young athletes to reach for and participate in a high level competition with peers from across Canada. For some athletes, it will represent a pinnacle in their sporting career; for others it will be an important step on a longer journey in sport. Speed skating is able to send male and female teams in both the short track and long track disciplines, with a total of up to nine athletes per gender. PEI training team programs typically begin two to three seasons in advance of the Games, giving young athletes the opportunity to learn and hone skills they can draw upon for the rest of their lives – skills such as long term goal setting, perseverance, discipline, resilience and team work. Back row, left to right: Rob Binns (ST Manager), Kyle Connell, Peter McQuaid, Andrew Binns, William Lyons, Thomas McQuaid, Sarah Taylor (ST Coach). Front row, left to right: Matthew McKenna, Mia Stewart, Jenna Larter, Carter Bruce. Age eligibility (Short Track): Competitors who have reached the age of 14, but not the age of 19 on June 30th, 2018. Date of Birth: July 1, 1999 to June 30, 2004 inclusive. Age eligibility (Long Track): Competitors who have reached the age of 14, but not the age of 20 on June 30th, 2018. Date of Birth: July 1, 1998 to June 30, 2004 inclusive. 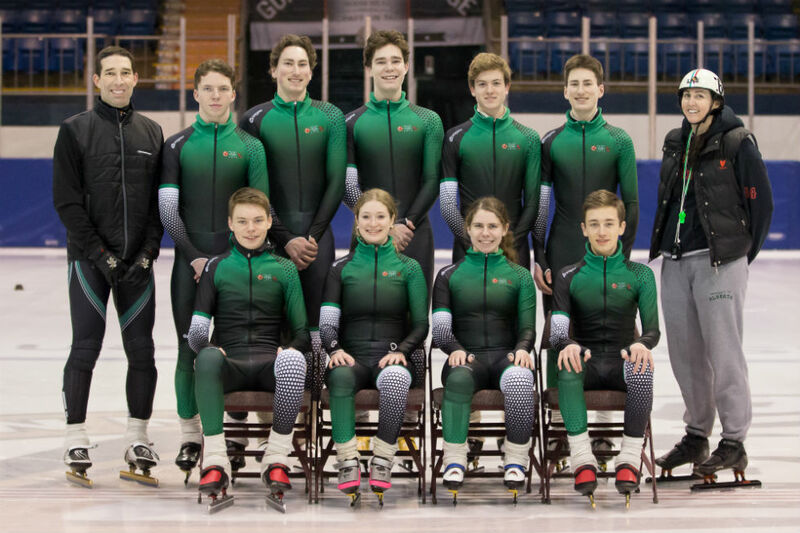 Team PEI’s eight short-track skaters competed during week one of the 2015 Canada Winter Games in Prince George, BC. The five male and three female skaters each competed in four individual events, while the men’s team also competed in the relay event. The individual events for both the men and women consisted of the 1500m, 500m, 1000m and, for the first time, the 3000m points race. The week full of highlights began early, when Carly Connell was named as the flag bearer for Team PEI in the opening ceremonies. Connell had been chosen as a member of PEI’s female soccer team for the 2013 Canada Games, but missed those games in Sherbrooke, QC after an injury and surgery. After a strong recovery, Connell entered the 2015 Winter Games as PEI’s top ranked skater. The competition week was filled with numerous personal bests and highlights for the PEI team. All eight Island skaters reached the quarter finals (top 36 skaters) in the 1500m event, while Connell advanced to the semi-finals. Seven PEI skaters advanced to the top heats (top 32) in both the 500m and 1000m distances. Carly Connell advanced to the quarter finals in both the 500m and 1000m distances, where she set new personal bests and provincial records in both races. In the 500m quarter final, she finished 3rd, behind the eventual gold and silver medal winners, while two of her 1000m quarter final opponents finished in the top five. Connell had top 15 finishes in all four events, with the highlight moment being a 9th place finish in the 1000m distance, by virtue of winning the C final. After a patient race, Connell made an outstanding outside pass on the final corner to win at the line. Connell also took 11th place in the 3000m points race, with a strong 3rd place finish in the B final. Peter McQuaid and Jared Vriends also turned in top twenty finishes for the Island team. McQuaid took 19th place in the 1500m event to open his strong week, while Vriends cracked the top twenty in the 1000m distance. The men’s relay team of Michael Rogers, Jared Vriends, Zach Moran and Peter McQuaid lined up against Quebec and Saskatchewan in their semi-final, looking for a fast time ahead of Saskatchewan for a chance to earn a spot in the A Final. The PEI team suffered a fall late in the race, but nonetheless eclipsed the previous PEI Canada Games relay record held by the 2007 men. In individual events, Miriam Burnett had a consistent week, finishing in the top 30 in all four of her events. Her best finish came in the 1000m distance, where she placed 26th. The youngest skater on the Island team, Burnett turned in big personal bests in both her 500m and 1000m distances. Korrina LeClair also turned in PBs in the 500m and 1000m distances, with her best finish (23rd) coming in the 500m. With her time of 50.176 seconds in her 500m heat, LeClair came within less than a second of Carly Connell’s provincial record for her age group in the distance. Among the men, Moran, Vriends, Peter and Andrew McQuaid each notched personal bests in both the 500m and 1000m distances. Vriends and Moran both went below 47 seconds, while both McQuaids went sub-48 seconds in the 500m. Michael Rogers also started the 500m event in promising fashion with a fast time in his preliminary round, before a fall in his heat derailed his chances in that event. Rogers, a team leader all season, had a challenging week with equipment troubles and falls in two of his timed distances, before finding some redemption in a well raced 3000m points race. The other four PEI men raced in the same 3000m points race final, with Andrew McQuaid, Jared Vriends and Peter McQuaid finishing first, second and third in the exciting race. PEI’s team of five male and four female short track skaters competed in five events, including the team relays. Strong finishes, new PEI records and numerous personal bests highlighted the week for members of Team PEI. Scott Beamish of Warren Grove, who entered the competition as the 18th seeded skater, recorded PEI’s top finishes of the week. In the 500 metre distance, which is considered the showcase event in short-track and was televised live on TSN, Beamish surged to an 11th place finish. Beamish also ranked 13th in the super 1500, 15th in the 1000 metre distance and was 25th in his 1500m event, good for 14th overall on the week. Ellen Burnett led PEI’s female skaters, setting two new provincial records during the week. She re-wrote her own record in the 1000m distance and knocked off a six year old PEI record in the 1500m, after shaving more than four seconds from her own personal best. Burnett, seeded 37th overall entering the Games, placed well above her seed with a 22nd place finish in the 1500m, 25th in the super 1500, 31st in the 1000m and 38th in the 500m competition. Clare Cullen also had a strong week, setting new personal best times in the 500m and 1500m distances and finishing above her 39th seed in three of four individual events, including a 30th place finish in the 500m event. Morgan McGinn took advantage of her week with new personal bests in the 1000m and 1500m distances, finishing four spots above her seeding in the 1000m event. McGinn saved her best for last, battling hard with several racers en route to her largest PB of the season in the super 1500. Taylor Johnston, despite nursing a knee injury through much of the week, achieved a significant personal best time in the 1500m event and finished above her seeding in two of four events. On the male side, Jesse Francis finished well above his original 37th seeding in every event, including a 22nd place finish in the 500m, 28th in the 1000m, 28th in his super 1500 and 32nd in the 1500m. Francis skated his 500m in under 47 seconds and also notched a new personal best in his 1000m event. Daniel Cottreau, seeded 39th entering the week, set a new personal best in the 500m distance. Cottreau broke the 48 second mark for the first time on his way to a 28th place finish in that event, after several outstanding races. Cottreau finished above his original seeding in all other events as well, posting 30th place in the 1500m, 35th in the 1000m distance and 34th in his super 1500. Nathan Cudmore set a new personal best in the 1000m distance and finished above his original seeding in three of four events during the week. Thomas Trotter, the youngest male skater from PEI and one of the youngest in the competition, skated in all four individual events and posted some of his best times of the season. Speed Skate PEI President Wendy Francis also congratulated the Island contingent. “We couldn’t be more pleased with the group that represented us in Halifax. They are superb athletes and individuals,” said Francis. Nine short track and 4 long track skaters competed during the first week of competition at the Canada Winter Games in Whitehorse, Yukon. Short track skaters competed in 4 distances (500, 100, 1500 & 3000m) as well as a 3000m relay. The women’s (Ellen Christie, Kathleen Cullen, Keisha Rose & Allie Byrne) and men’s (Jake Byrne, Tyler Coyle and Scott Murray) relay teams both broke PEI provincial records as they finished 5th and 6th respectively. Amazingly, the men’s relay provincial record was made with just three skaters (an injury prevented a full complement of 4 skaters from participating) and with one skater falling during the race. In the individual distances all skaters achieved personal best times in at least 2 of the 4 distances competed in and most skaters had seasonal best times in the remaining distances. Notable performances included Ellen Christie with 3 personal best times that were also PEI provincial records, Kathleen Cullen with 3 PB’s including 1 provincial record (later broken again by Ellen Christie! ), Jake Byrne with 2 PB’s including 1 provincial record and Constance Holman with 4 PB’s. Although injured after a fall and forced to miss several races Simon Watts returned to make his 3rd PB of the competition in the grueling 3000m distance. With the relay provincial record Ellen Christie finished with 4 provincial records; she was also the first women trained on PEI to skate faster than 50 seconds in the 500m distance! Final standings after combining results from all distances had Ellen Christie finishing as the top PEI female skater (23rd) and Jake Byrne as the top PEI male skater (25th); this was an improvement for both of them from their original seeding placement prior to the competition. Results for the remaining short track skaters are as follows: Kathleen Cullen (31), Keisha Rose (41), Constance Holman (43) and Allie Byrne (44) in the female division (55 total skaters) and Tyler Coyle (34), Scott Murray (37) and Simon Watts (50) in the male division (56 total skaters). 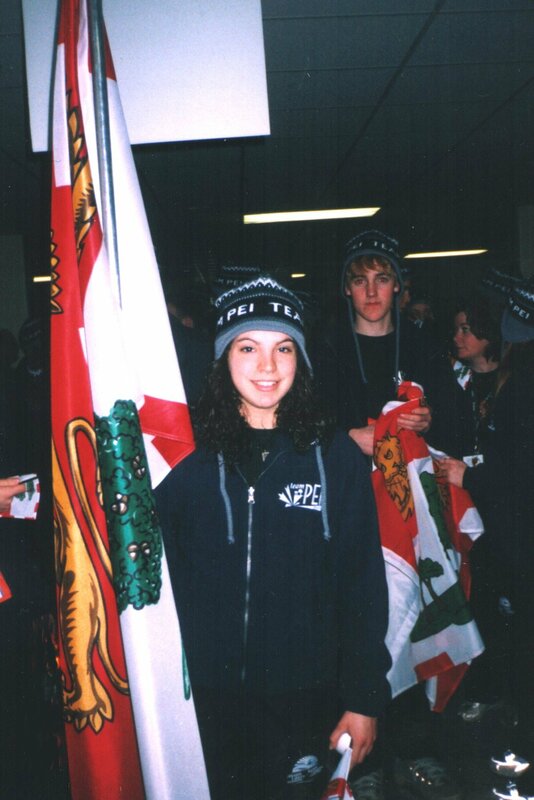 Jenna Gallant is Team PEI’s flag bearer at the Opening Ceremonies.